The invitation to the pajama party had to be fabulous, of course (one of my party-planning rules!) So, I came up with a trivia quiz invitation. 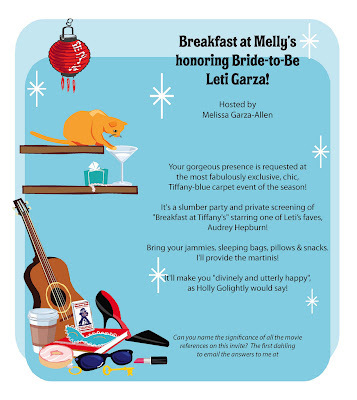 I put as many Breakfast at Tiffany’s-inspired items on the invitation and challenged all the girls to email me with the answers. I forgot to mention to Leti that she couldn’t play, so I got a quick response from her with all the answers! Although, I did stump her on a couple. Hee hee. See if you can catch all the answers to the clues. 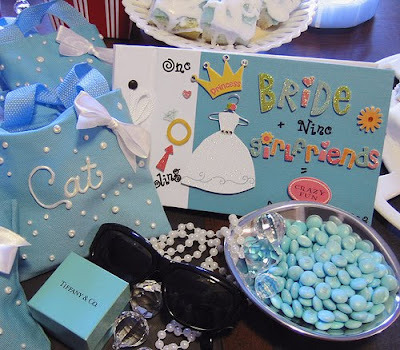 Moving on…When I have a theme party, I want to go all out. I decided watching the movie on our regular-sized tv wouldn’t be spectacular enough. So, I did a bit of research and rented a projector unit that we could hook up to our DVD player. Then, I pinned a king-sized white sheet to my drapes, and threw a bunch of pillows and blankets on the floor. Instant home theater! It was rad! I watched Star Wars on the “big screen” the next day with my husband… AWESOME! 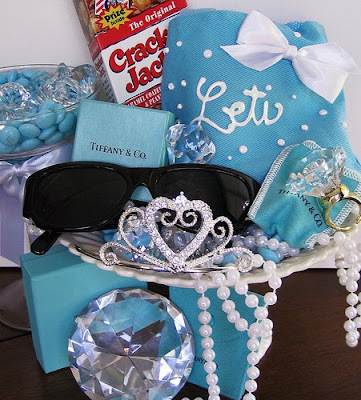 For snacks, I served Cokes, wine, popcorn (in popcorn boxes, of course), Cracker Jacks (you know why if you’re a die-hard Breakfast at Tiffany’s fan) and other movie theater candy-- Jr. Mints, please! One of the girls brought a stuffed pizza roll, which was yummy, too. If you don’t have an ultra-swanky home theater, try my bed sheet and projector combo. 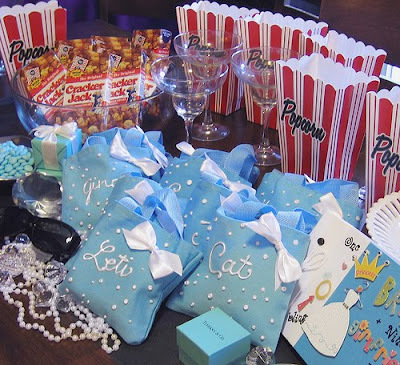 Wouldn’t it be so cute for a little girls slumber party…a Hannah Montana Movie premiere party complete with sunglasses and boas and a red carpet from the front door to the screening room! And, remember to arm your little paparazzi with disposable cameras! Whatever movie you premier, make sure to bring the Milk Duds! Update: Breakfast at Melly's was featured on Tip Junkie and Not Just a Mommy! 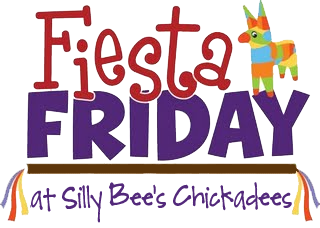 Thanks, chickadees! I've read the boo but I've never seen the movie - how crazy is that? Such an adorable party! Congrats on being featured on Tip Junkie! I love this idea! I watch Breakfast at Tiffany's every year on October 2nd...the day I moved to Utah. My favorite movie turned into a party! Super cute party! :) I love that movie! these are so awesome. where did you get the little blue canvas bags?